To control the stability of the lysine acetylsalicylate compound (LAS) in aqueous solution, some studies of the hydronium ion-catalyzed, hydroxide ion-catalyzed, and spontaneous reactions of this active ingredient in water solutions have been carried out. The pH-rate profile (log kobs = f(pH)), shows that the hydrolysis reaction of the LAS, is conducted by a catalysis acid-base mechanism, with multiple reaction pathways. The rate constants, kH, kOH and k0 to the reaction pathways catalyzed by H3O+, HO– ions and to the spontaneous reaction, for the hydrolysis reaction of the reagent LAS, were determined. The results show that the studied compound LAS is unstable in basic medium and the hydrolysis reaction catalyzed by HO– ions is predominant.For a known acidity (pH » 10), studies conducted for different temperatures of the medium, clearly indicate, that the experimental rate constant kobs ,depends on the temperature according to the Arrhenius equation. The activation parameters: activation energy (Ea), enthalpy (ΔH≠) and entropy (ΔS≠), for the transition state were determined, The very negative value obtained for the activation parameter ΔS*, first indicates that in the transition state there is gain in order, then this late state, resembles the products and that probably for the mechanism of the LAS hydrolysis reaction catalyzed by HO– ions, the rate-determining step is a bimolecular reaction. Finally from all these results, the mechanism for the reaction pathway catalyzed by HO– ions has been elucidated. The LAS compound is an active ingredient known to Aspegic. It is a molecule that is part of the family of salicylates including aspirin, which represents one of the most commonly, used drugs in the world. Aspegic is an acetyl derivative of salicylic acid that is a white, crystalline, weakly acidic substance. Acetylsalicylic acid decomposes rapidly in solutions of ammonium acetate or of the acetates, carbonates, citrates, phosphates or hydroxides of the alkali metals. Acetylsalicylic acid is stable in dry air, but gradually hydrolyses in contact with moisture to acetic and salicylic acids. In solution with alkalis, the hydrolysis proceeds rapidly and the clear solutions formed may consist entirely of acetate and salicylate. The principal cause of the hydrolysis of this family of the salicylic acid acyl esters (e.g. aspirin), in aqueous solution about pH 3, is the attack of these substances by water ions (H3O+ or HO–) [1-6]. Since Edwards has shown that the rate of hydrolysis of aspirin is independent of pH between pH 4 and 8, the reaction has been the subject of a number of studies, particularly by Garrett [1,3-5]. Edwards suggested that in this pH range, the hydrolysis reaction resulting from the attack by a water molecule on the anion of aspirin (Scheme 1), but several authors have pointed out that this mechanism is not consistent with Edwards’ own demonstration, showing that the hydrolysis reaction is not catalyzed by acetate ion, a considerably more powerful nucleophile than water. Scheme 1. Hydrolysis reaction of the LAS reagent. seriously questioned this mechanism. He found that the addition of ethanol to the solvent increases the rate of solvolysis, and that ethyl acetate is then a product [3-6]. He ruled out the possibility that the rate increase is a generalized solvent effect by showing that the addition of dioxane has very little effect on the rate of hydrolysis of aspirin. Garrett tried to explain his results by proposing a mechanism involving nucleophilic attack by ethanol on the tetrahedral carbon atom of the intermediate (2) (Scheme 1), but this explanation has not been generally accepted . Nevertheless, the demonstration that the addition of ethanol increases the rate of solvolysis does suggest strongly that the question of the involvement of a molecule of solvent in the transition state ought to be reopened. The work of Jencks and Gilchrist  shows clearly that ethanol and ethoxide ion are stronger nucleophiles than water and hydroxide ion in reactions at the carbonyl group, and a rate-determining step involving attack by either species would explain Garrett’s results. where kH is the specific second-order rate constant for the hydronium ion-catalyzed reaction, k0 is the specific first-order rate constant for the spontaneous reaction, and kOH is the specific second order rate constant for the hydroxide-catalyzed reaction. This paper reports on the hydrolysis kinetics of the LAS compound (LAS), for pH values between 0.50 and 13. This detailed study for a wide range of pH, allows the one hand, to extract significant results and secondly, to have an overview on the various possible mechanisms for the hydrolysis of this important reagent. Inorganic salts were of analytical grade, and were used without further purification, as well used normadoses solutions of HCl and NaOH were analytical grade. Water was further glass distilled before use. The LAS was obtained commercially. 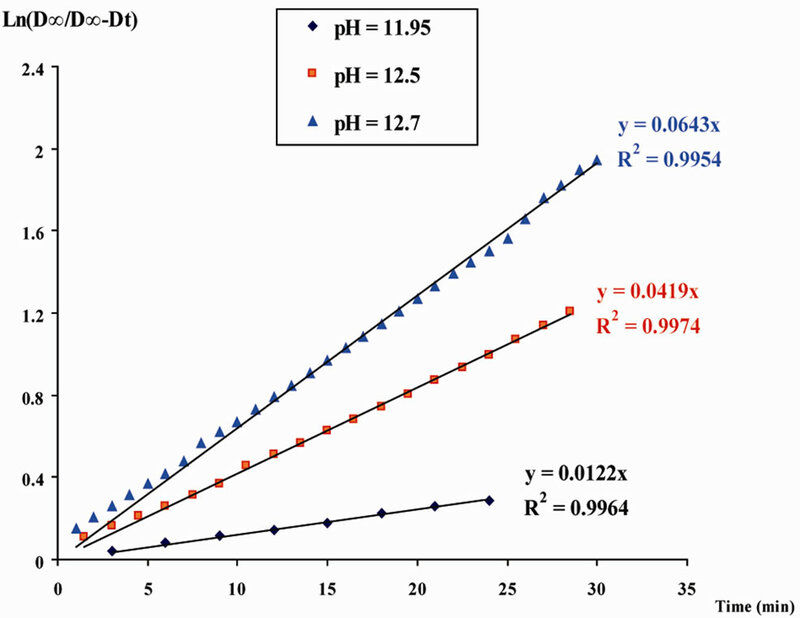 Aqueous solutions of reagent LAS of known concentrations 5 × 10–4 M and 10–3 M were prepared, the desired pH values are determined by adding the quantities: HCl (0.5 M) or NaOH (1 M), respectively for acidic or basic mediums and these pH values are measured with a Hanna 210 microprocessor pH-meter, equipped with a combined glass electrode and calibrated with commercial buffers (pH 4.00 and 7.00). These solutions are maintained at fixed temperature 298 K, and small aliquots were withdrawn at known time intervals. These samples were analyzed by standard Helios g UVvisible spectrometer, using quartz cells of optical path length l = 1 cm. The absorption measurements have been performed at wavelength lmax = 300 nm. 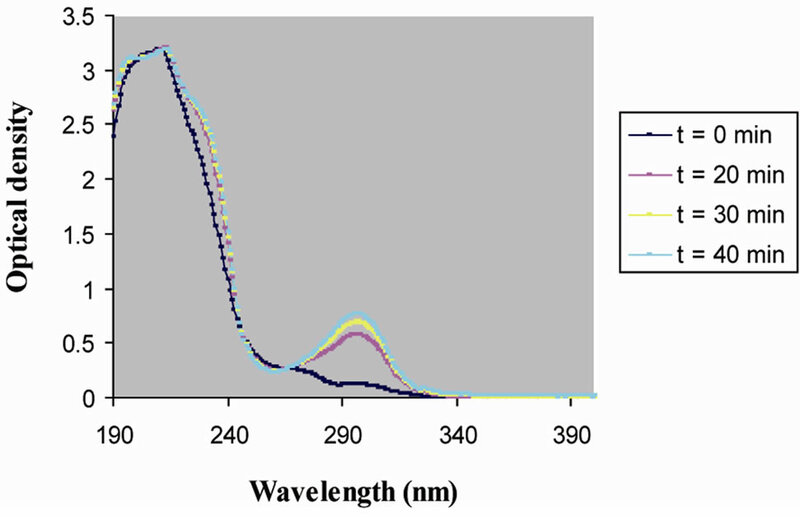 Indeed, the UVvisible spectra of Figure 1, clearly show that the salicylate ion formed by hydrolysis of the LAS, has a maximum band of absorption at lmax = 300 nm, and at this maximum wavelength, the reagent LAS has a negligible absorption. The initial concentration denoted “a” of the reagent has always been very low (5, 10–4 M), so that all the spectrophotometric measurements were carried out under conditions of pseudo-first-order, with higher concentrations of reacting species (H3O+, H2O and HO–), compared to this initial concentration a. All experimental values of optical densities were measured by reference to pure water. Figure 1. 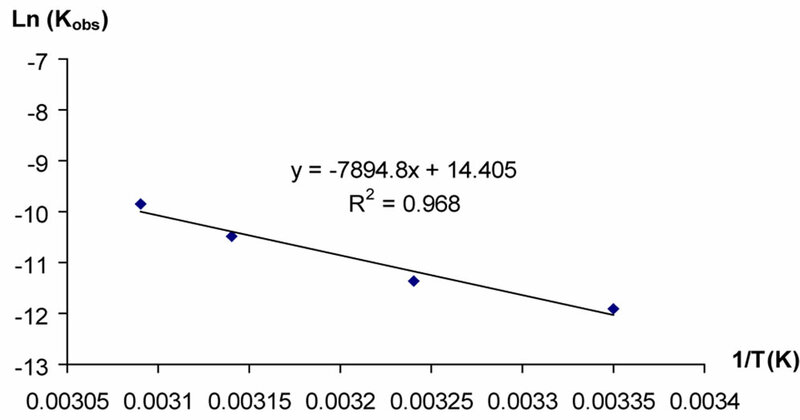 UV-Visible spectra for the hydrolysis of the reagent LAS, pH = 11.66, [LAS] = 5 × 10–4 M.
has been studied at 298 K in the pH range of 0.50 to 13 and the kinetics of this hydrolysis phenomenon have proved sensitive to the medium acidity, therefore, there is possibility of the existence of a catalysis phenomenon by ionic species of water (H3O+ and HO–). Generally, the mechanism of hydrolysis may be conducted according to the following Scheme 2. The rate constants of second-order kH and kOH, are associated with catalytic decomposition process, respectively, in acidic and basic environments. While the rate constant of first-order k0, is involved in the process of hydrolysis under the effect of solvent molecules, however, it must be noted that this constant k0 result of the operation * 55.55 (water concentration), with is the rate constant of second-order corresponding to the process of hydrolysis by an elementary molecule of the water. Scheme 2. 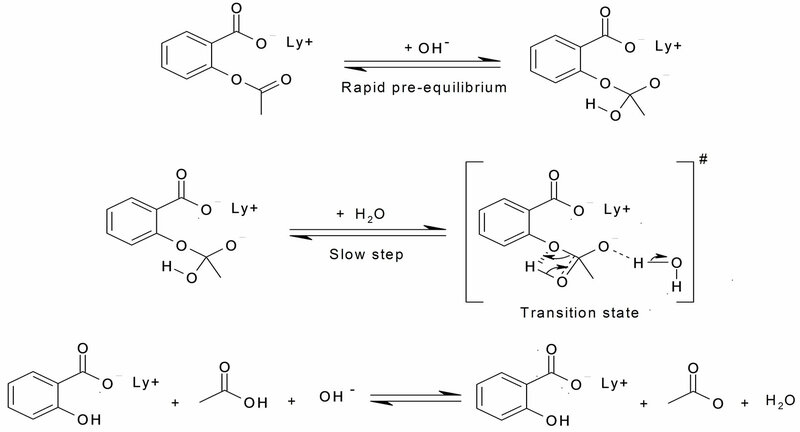 Different reaction pathways proposed for the hydrolysis reaction of LAS. where l is the optical path, a and x are the respective concentrations of LAS reagent and hydrolyzed product. From the kinetic law of Equation (3) and the preceding relations Equation (5), we can establish relationships that express the evolution of the optical density versus time t.
The graphic in Figure 2 illustrates the good linearity of the observed experimental lines. Figure 2. 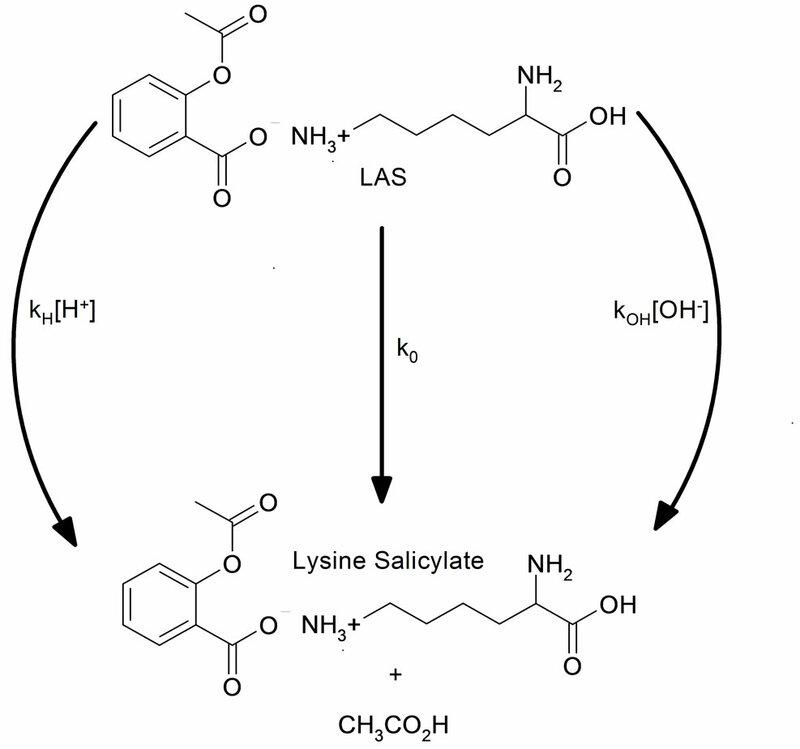 Kinetics for the hydrolysis reaction of LAS reagent, in different basic solutions at 298 K.
lines. Table 1 includes all results related to the phenomenon of hydrolysis of the LAS compound. These results show, firstly that the rate of hydrolysis reaction of this compound depends on the acidity of the medium and the reaction pathway catalyzed by the HO– ions on the hydrolysis reaction is predominant, on the other hand, values of these apparent rate constants (kobs) change in different ways, according to three pH ranges. 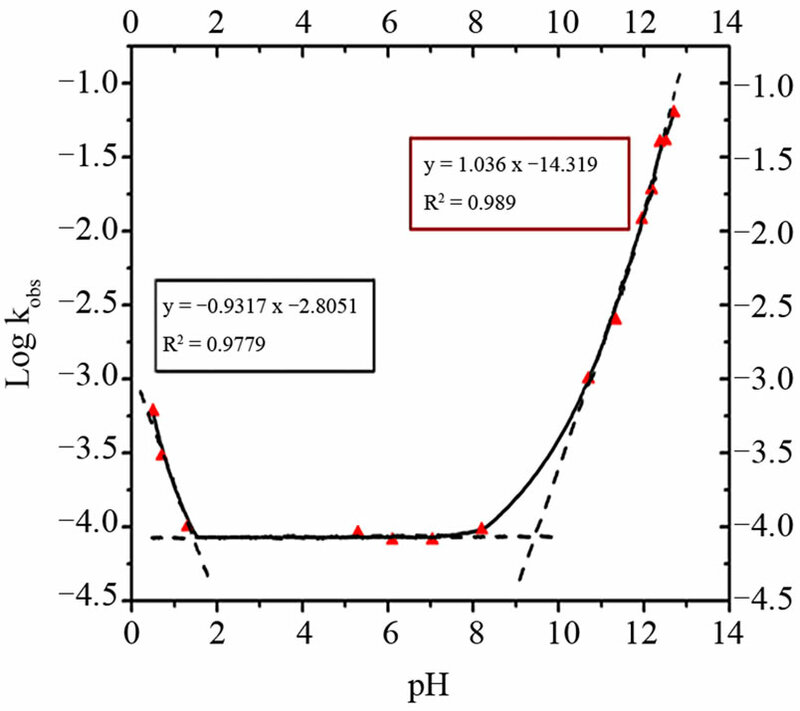 From these values, the pH-rate profile graph (log kobs = f(pH)), was established (Figure 3), and the obtained experimental curve shows three different slopes (p = –1, 0 and +1). Table 1. Evolution of the apparent rate constants (kobs) on the medium acidity. Figure 3. pH-rate profile for hydrolysis reaction of the LAS reagent at 298 K.
These results indicate that the hydrolysis reaction of the LAS reagent, is achieved using an acid-base catalysis mechanism, the reaction pathway catalyzed by HO– ions is dominant, and the degradation of this compound is important in basic medium. This value of the rate constant kOH on the hydrolysis reaction of LAS in basic medium is the same order of magnitude as the values of the constants kOH determined for the picryl chloride and trinitro-anisole hydrolysis reactions [16-18]. It is considerably less than the value calculated for the hydrolysis of 7-chloro-4,6-dinitrobenzofurazan , while this value is much higher than the values announced for the hydrolysis reactions of styrene oxides . Table 2. The three rate constants for the hydrolysis phenomenon of LAS. tion pathway in the hydrolysis process of studied reagent (LAS). 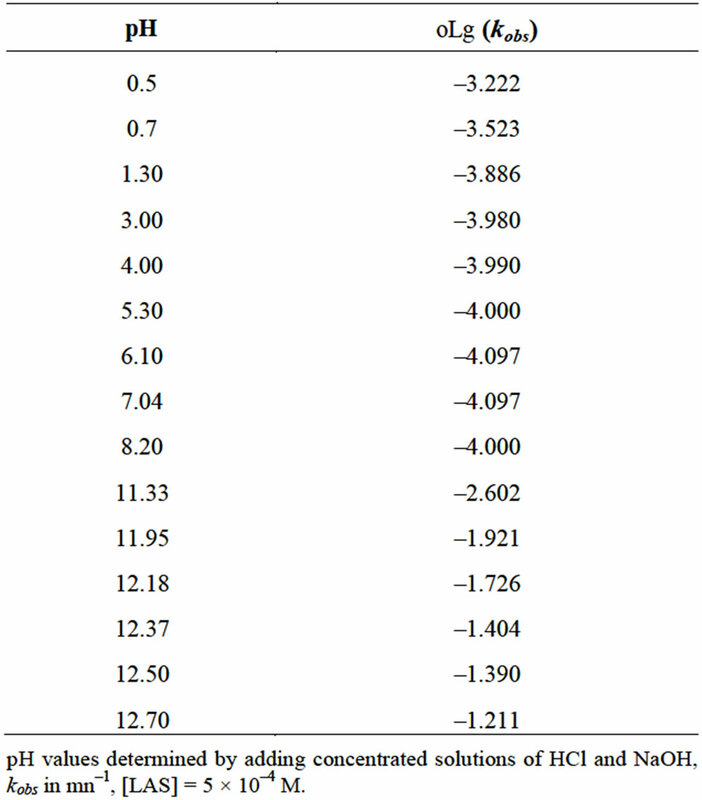 We followed the kinetics of the studied hydrolysis reaction in basic medium of constant pH (10.12), by varying the temperature between 298 and 323 K. The experimental values of the apparent rate constant kobs were calculated in the same way as the previous section, and Table 3 summarizes all results. The linear relationship between Ln kobs and the inverse of absolute temperature (1/T) represented by the graph in Figure 4, indicated firstly, that a consistent solvolysis mechanism operated for this hydrolysis reaction pathway catalyzed by HO– ions, on the other hand, the Arrhenius law is well verified for the studied temperatures and the activation parameters for this process were calculated from the slope and intercept on the experimental right. Ln kobs = f(1/T), plotted for the interval of studied temperatures, with the following values for the activation energy Ea = (65.60 ± 0.05) kJ.mol–1 and the preexponential factor in the Arrhenius relationship A = (1.803 ± 0.005) 106 s–1. Table 3. The apparent rate constant kobs evolution vs. the temperature. Figure 4. The Arrhenius representation Ln kobs = f(1/T) for the hydrolysis reaction of the LAS reagent at pH = 10.12. Figure 5. Mechanism for hydroxide ion catalyzed hydrolysis of the LAS reagent. 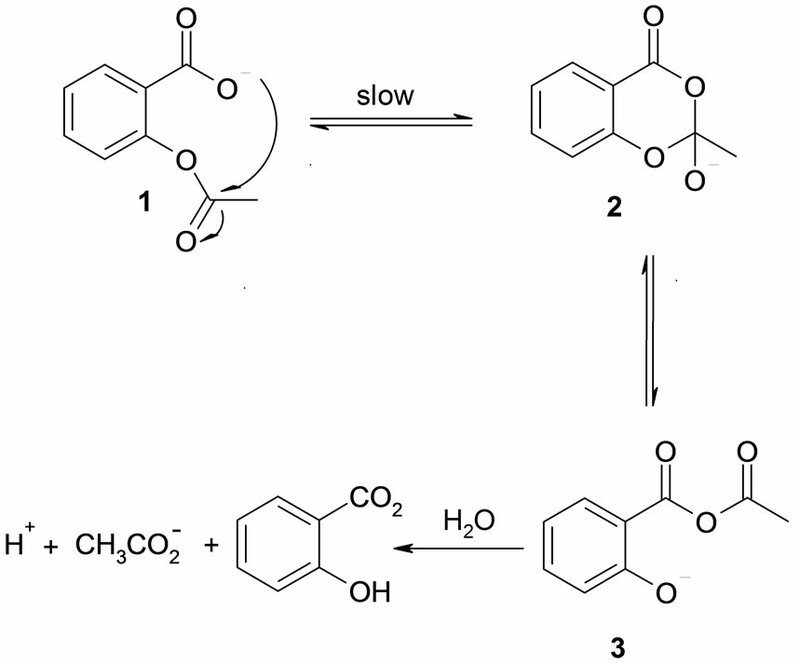 This mechanism for the reaction pathway catalyzed by HO– ions, composed of three steps, indicating that Step 2 on the association of a water molecule with the carbanion produced by Step 1, is rate-determining step, with a highly ordered transition state whose structure resembles the products of the reaction. The passage through this highly ordered transition state with cyclic and internal transfer of hydrogen atoms from one site to another, well justifies the activation energy required for the formation of this transition state, and the very negative value of the activation entropy (ΔS≠ = –133.42 J.K–1.mol–1). Moreover, this very negative value is in favor of a bimolecular process involving two species, to imagine that highly ordered transition state. Indeed, the value of this parameter (ΔS≠) is very useful for identifying the rate-determining step molecularity. Recent studies on the degradation kinetics of some compounds [23,24], indicate clearly that for the unimolecular process, the values of the activation entropy ΔS≠ are positive. Studies in this work have identified the stability of the active reagent LAS as a function of the medium acidity, to determine the different rate constants for the three reaction pathways involved in the hydrolysis process of this compound. Finally a study of the temperature influence has been achieved for the hydrolysis reaction in basic medium, and the activation parameters for transition complex were determined. The analysis of these results has identified an acid-base catalysis type for the hydrolysis process of this studied compound, with a clear predominance for the reaction pathway catalyzed by HO– ions in basic medium, and for this reaction pathway, the activation parameters on the transition complex was determined based on expressions derived from the transition state theory. On the one hand, the values of these parameters allowed us to propose a reaction mechanism consisting of three steps for the hydrolysis phenomenon of reagent LAS in basic medium, and secondly, to clearly specify the rate-determining step for this proposed mechanism. J.-P. Lee and T.-S. Uhm, “Kinetics and Mechanism of the Hydrolysis Reaction of N-Furoyl-2-Phenylimidazole,” Bull of the Korean Chemical Society, Vol. 21, No. 1, 2000, pp. 29-30. F. Boujelbane and N. B. Hamida, “Étude Cinetiaue de la Dégradation Hydrolytique d’un Insecticide: Le Bendiocarb,” Journal de la Société Chimique de Tunisie, Vol. 9, No. 2, 2007, pp. 121-132. F. Boujelbane and N. B. Hamida “Étude par HPLC et Spectrophotométrie UV de la Dégradation Hydrolytique d’un Insecticide, le Zectran,” Journal de la Société Chimique de Tunisie, Vol. 10, No. 1, 2008, pp. 39-51.